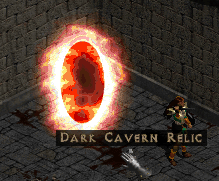 The following is a list of all (official) changes made to Path of Diablo from Vanilla D2. New Realm: For those that haven't played in a few months: We have moved the realm to what we believe is a better server and also improved the software. We hope to have increased speed and reliability to the login server and hopefully we can support more online players without issues. We've extended the season by about 3 months so that we could improve issues that we've been dragging behind for years now. So thank you for your patience. Horadrim Sigil acquisition has changed. The sigil will always drop from Nihlathak in Normal and can sometimes drop from Nihlathak in Nightmare and Hell. The Orb of Enchantment can sometimes drop from Nihlathak (in Nightmare and Hell) and from the Forgotten Desert relic boss. The orb can also drop from any monster in the game just like the Orb of Corruption does. Uber Izual has ascended and earned the modifier ‘Prime Evil’. (this basically makes him like the act bosses and other ubers who have special resistances and damage reductions). Forgotten Sands relic may now spawn Blood Lords instead of Fallen. 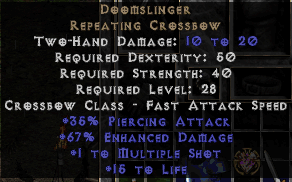 Act 1 Mercenaries can now equip Crossbows. All summons will now properly show the quantity of summons alive (such as Grizzly Bear that continued to show one while two were alive). Redemption Runeword's starting life/mana gain reduced from 50 to 25. Redemption Runeword's life/mana gain per level reduced from 10 to 8. Grief Runeword’s min dmg per level has been reduced from 4 to 3.375 and max dmg per level from 4.375 to 3.625. Inner Sight, Phase Run, Armageddon and Hurricane can now be assigned to left click. Desecrate can no longer be assigned to left click. Pus Spitter has been reworked. Pompeii’s Wrath has been reworked. Bing Sz Wang has been reworked. Vidala’s Fetlock has been reworked. Stormshield’s ‘damage reduced by 35%’ stat has been reduced to 30%. New enchantment: +50% increased Sanctuary Area Damage Rate. New enchantment: +30-50% increased Skeleton Mage projectile speed. New enchantment: +40-60% increased Charged Bolt Sentry projectile speed. New enchantment: +25-35% Magic Arrow damage converted to magic. Valkyrie’s cooldown has been reduced from 6 to 3 seconds. Dragon Talon and Dragon Flight now require one-handed melee weapons (This is because two-handed weapons weren’t actually apply their damage correctly so hopefully this is only a temporary solution). Blades of Ice icicles will no longer trigger monster procs such as the lightning when hit from scarab demons (this doesn’t affect on-death triggers). Blades of Ice icicles can no longer knock monsters into hit recovery. Static Strike damage synergy from Shock Web increased from 5 to 8%. Emberstorm damage synergy from Fire Blast increased from 16 to 18%. Wake of Fire damage synergies reduced from 22 to 20%. Wake of Inferno damage synergies from Fire Blast & Death Sentry increased from 10 to 13%. Power Throw weapon damage increased from 110% to 120%. Concentrate now receives a 10% damage synergy from Taunt. Volcano physical damage synergy increased from 19 to 20%. Desecrate vampire corpse changed to succubus. Raise Skeleton has been renamed Raise Skeleton Warrior. Bone Spirit damage synergies increased from 8 to 10%. Corpse Explosion now gains 1% damage per base level. Bone Offering’s +Damage% has been changed to +Raised Skeleton Damage% which benefits both Skeleton Warriors and Skeleton Mages (also benefits physical damage of Revives but not elemental damage yet sadly). Blessed Hammer damage synergies increased from 12 to 13%. Enflame’s damage scaling per level, at levels 23+ has been reduced. Enflame can no longer be cast on other players (it will continue to work on summons and mercenaries). Enflame now gains 2 seconds duration per level. Immolate damage scaling at levels 23+ have been reduced. Meteor damage synergies increased from 5 to 6%. Charged Bolt’s travel speed has been reduced at level 1 and will now increase per level. Thunder Storm now receives a damage synergy from Lightning Surge. Thunder Storm damage synergies increased from 10 to 20%. Energy Shield now starts with 10% efficiency. Energy Shield efficiency synergy from Telekinesis reduced from 5 to 4%. Freezing Pulse damage synergies increased from 4 to 5%. Frost Nova damage synergies have been reduced from 21 to 19%. Fixed a bug with Dual Strike not properly showing the damage increases from Weapon Block synergy. Fixed a bug which caused Crazed Sorcerer and Root of all Evil to trigger the Overseer quest when spawning with baal minions. They will now both spawn with different monsters next to them. A new relic tier has been added to the game. Hephasto’s relic drop chance increased. Uber Tristram area changed to reduce obstacles and obstructions as well as shrink the area size slightly. The Infernal Trial area has been decreased in size. Undead Commanders from Infernal Trials had some of their ‘Fire/Cold/Lightning Resistances’ replaced by ‘Fire/Cold/Lightning Absorb +%’. Orb of Enchantments no longer drops from all monsters and no longer works on Helms. Orb of Enchantments will now apply to a new unique grand charm called The Horadrim. Both the orb and the charm are exclusively available in a relic. Added some new enchantment stats. Orb of Corruption drop chance in relics has been reduced slightly. The following skills can now be assigned to Left Click: Psychic Hammer, Flesh Offering, Bone Offering and Desecrate. Fixed the cost/repair multiplier on some stats which was increasing costs unintentionally for some items with special/hidden stats. Increased the durability of all weapons by 50% (will not affect existing items in non-ladder). Throwing weapons of exceptional quality have had their maximum stack size increased from 500 to 800. Throwing weapons of elite quality have had their maximum stack size increased from 500 to 1200. Arrows and Bolts can now spawn the following stats: Poison Damage, Reduced Magic Damage Taken, Maximum Damage(Based on Character Level), Crushing Blow, Deadly Strike, Open Wounds. Wisp Projector absorb lightning has been reduced from 10-20% to 8-12%. Lightsabre absorb lightning has been reduced from 25% to 15%. The unique item Schaefer’s Hammer has been reworked. The unique item Corpsemourn has been reworked. The unique item Head Hunter’s Glory has been reworked. The unique item Firelizard’s Talons has been reworked. 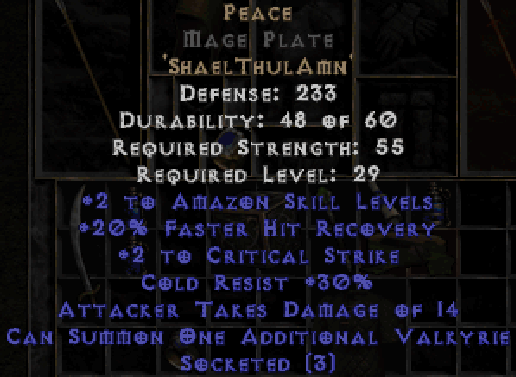 The unique item Magewrath has been reworked. The set item Naj’s Circlet has been reworked. Charged Strike now has a maximum cap of 9 charged bolts. Multiple Shot and Strafe have had their damage scaling improved slightly. Magic Arrow now always pierces. Reverted the Blades of Ice attack animation which was accidentally changed when reworking the skill. It now uses the same animation as the vanilla version. Dragon Talon kick damage synergy from Dragon Flight has been increased to 15% (was 10). The Shadow Master will now properly use all changed assassin skills like Blade Shield, Emberstorm, Static Strike or Dragon Talon. Blades of Ice cold damage per level has been increased by about 50%. Blades of Ice cold damage synergy from active Ice charges increased from 10 to 20%. Static Strike lightning damage scaling has been increased slightly at lower levels and moderately at higher levels. Static Strike lightning damage synergy from active Thunder charges increased from 10 to 20%. Emberstorm fire damage per level increased by about 30% at all levels. Emberstorm fire damage synergy from active Ember charges increased from 10 to 20%. Emberstorm fire damage synergy from Fire Blast increased from 13 to 16%. Fade and Burst of Speed duration per level increased from 12 to 16. Venom duration per level increased from 4 to 8. The stats ‘+% Lightning Skill Damage’, ‘-% Enemy Lightning Resist’, ‘+% Fire Skill Damage’ and ‘-% Enemy Fire Resist’ now work with all Assassin sentries. Cleave weapon damage has been increased from 50% to 60%. Crushing Blow and Deadly Strike chance during Whirlwind has been reduced from ½ to ⅓ .
Whirlwind weapon damage reduced from 100% to 90%. Fire Claw damage synergies reduced from 17% to 13%. 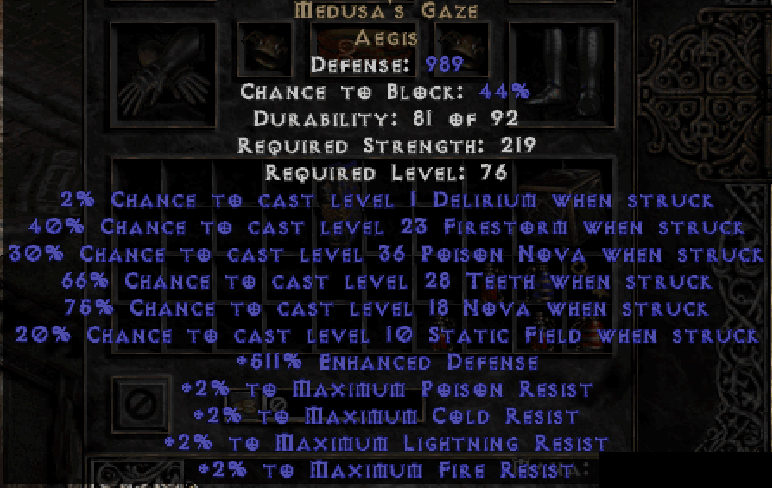 Fire Claw fire damage scaling at lvl 23+ has been reduced slightly. Raven cold damage synergy increased from 20% to 21%. Raven physical damage synergy increased from 18 to 20%. Molten Boulder knockback chance reduced from 50% to 30%. Molten Boulder’s flame animation is both smaller and shorter visually. In the original game, the fire trail left by Molten Boulder only dealt damage near the boulder which means the long fire trail left behind, which lasts multiple seconds, did not actually deal damage. So the new visual effects now represent exactly the hitbox of the boulder fire trail. The new flame is also shorter in height. Both of these changes help reduce visual clutter and have no gameplay impact. Molten Boulder no longer has a cooldown. Molten Boulder damages have been re-balanced and synergies changed significantly with the goal of reducing its power early due to the cooldown removal but improving its scaling into the end-game. Bone and Flesh Offering starting duration increased from 4 to 5 seconds. Bone and Flesh Offering radius gained per level has been doubled. Raised Skeletons and Skeletal Magi will now once again improve their look as Summon Mastery is leveled like was the case in vanilla with Skeleton Mastery. Reverted a previous change to Blessed Aim which added flat accuracy in addition to the accuracy%. Blessed Hammer projectile speed has been increased. It will circle around the player quicker which should result in a more consistent and responsive AoE with less delay when targeting monsters behind the player. The hammers also appear left of the character now to properly represent the damage path. In the original game the hammer’s first 6 frames are invisible so it only starts appearing when in front of the character but was still dealing damage to the left. Now the animation will be synced with the damage path it always had. Concentration will now show the hidden bonus it gives to Blessed Hammer. Sanctuary magic damage synergy from Cleansing increased from 15% to 18%. Sanctuary has a new magic damage synergy from Dashing Strike (18%). Redemption aura radius has been decreased from 24 to 16 yards. Discharge lightning damage scaling at level 17+ has been reduced slightly for a more linear damage progression. Discharge lightning damage synergy from Nova has been reduced from 4% to 3%. Nova lightning damage scaling at level 28+ has been reduced slightly. Nova’s lightning damage synergy from Discharge has been reduced from 4% to 3%. Meteor’s cooldown has been reduced from 2.52s to 1.28s. Fixed a bug which caused Unique and Set boots to not properly apply kick damage. Fixed a bug which caused boots to keep dealing the old kick damage after upgrading the base. So exceptional boots upgraded to elite kept dealing their exceptional base’s damage and same for normal to exceptional. Fixed a bug which caused the poison version of Raise Skeletal Magi to deal much more damage than all other elements. Fixed a bug which caused Ball Lightning to deal no damage. Diablo (clone) from Infernal Trials now has more life and some of his ‘Fire/Cold/Lightning Resistances’ have been replaced by ‘Fire/Cold/Lightning Absorb +%’. The following skills can now be assigned to Left Click: Hydra, Meteor, Blizzard, War Cry. Further improved the wording of the Magic Damage Reduction stat for clarity. This has no gameplay impact and still behaves exactly like the original game. Added lootfilter support for custom drop sounds. The maximum kick damage on boots has been set to 1.5x the minimum damage which may cause an increase or decrease in maximum kick damage depending on the original range for the boots. (existing boots will show the new damage values but only new boots will correctly work with the new Dragon Talon changes. So you will need to get new boots after the patch if you wish to start gaining the kick damage). Points into Strength no longer increases kick damage. The Redeemer’s “Damage +(60-120)” stat has been changed to “Adds 80-120 Damage” this is to fix bugs related to “Damage +X” mods not scaling like regular damage does on attack skills and also giving extra physical damage to skills that shouldn’t be benefiting like Smite. Plague Runeword will now correctly show the Cleansing aura level (this will not apply to existing items). Lightning Bolt now requires Power Strike and Poison Javelin. Lightning Bolt now has a Power Strike synergy. Charged Strike no longer requires Lightning Bolt. Poison Javelin now receives 2% increased poison damage per dexterity. Flicker Strike renamed back to Dragon Flight. Dragon Talon and Dragon Flight will now deal additional kick damage from boots. Dragon Talon and Dragon Flight now have a kick damage bonus that goes up per level. Dragon Talon now has a kick damage synergy from Dragon Flight. Changed Dragon Flight’s claw/dagger requirement to boots requirement to match Dragon Talon. Added the claw/dagger requirements to the skill description of all martial arts skills for better clarity. Blades of Ice's mana cost per level has been decreased from ~0.5 to ~0.25. Dual Strike now has a damage synergy from Weapon Block. Fire Claw’s damage per level (at levels 23+) has been decreased. Fury is no longer interuptable. Vengeance’s elemental damage and synergies have been reverted back to the original game’s values. Vengeance will now give the elemental damage to the character during the attack which will cause it to work with Melee Splash. Vengeance’s tooltip will now clearly show the physical weapon damage being used for the calculation as well as the resulting elemental damage. The calculations are done exactly like in the original game. 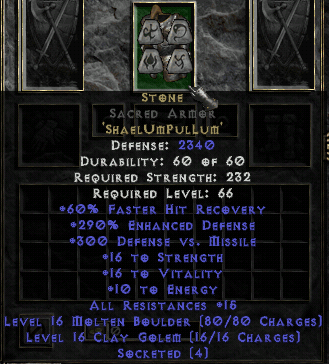 Fixed a bug with Cham Rune which caused the ‘Reduced Skill Cooldown’ stat to be disabled on Armors and Shields. (Hopefully) fixed a multiplayer-only bug with “Fires Explosive Arrows” stat found on items such as Ravenclaw. Fixed a bug which allowed Orb of Corruptions to be consumed on a normal (white) item even though it cannot actually roll anything on normal quality items. Fixed a tooltip error that showed power strike as having 110% weapon damage when it always had 100. Fixed some tooltip errors with Dragon Talon. Fixed a bug which caused Fend to require level 18 even though it was previously moved to the level 12 row. Added a new crafting orb: Orb of Enchantment. Improved the way Diablo’s laser works so that it no longer leaves gaps where melee characters can stand to avoid damage. This does end up causing Normal Diablo’s damage to have increased a tiny bit so be careful. Diablo Clone and Uber Diablo now use a much more dangerous lazer that has the previously mentioned fixes but also a ton of damage. Be careful out there! Reduced Key of Chaos drop rate. The Infernal Trial area has been made smaller. A new Relic tier is now available. Act 3 Mercenaries will now have 15% chance of impact-damage avoidance. Added Piercing Attack % on the advanced character sheet. Dream Runeword’s Holy Shock aura level has been reduced from 15 to 13. Steelshade’s Life gained on melee hit stat has been lowered from 97-121 to 66-89. Marrowwalk’s +1-3 Flesh Offering stat has changed to +1 Flesh Offering or +1 Bone Offering. Lawbringer’s Level 15 Decrepify proc has been lowered to level 7. Frostburn’s ‘Increased maximum mana’ has been lowered from 40%(static) to 30-35%(varies). Also the ‘cold damage’ has been increased from 1-6 to 6-12. Souldrainer’s ‘8% chance of level 3 weaken on striking’ has been changed to ‘level 8 weaken charges (34)’. Laying of Hands’ ‘+350% Damage Against Demons’ has been lowered to +225-250% (varies). Fixed Phoenix Runeword’s ‘100% chance to cast level 40 Dodge on Level-Up’ by changing it to the new Blaze. Added 1-80 Lightning Damage to Warshrike to make up for the removal of Nova proc in the middle of Season 4 (due to graphical issues it caused). Does not apply to existing Warshrikes. The Amazon’s Dodge, Evade and Avoid skills will no longer trigger a dodge animation which also means they will no longer interrupt the amazon while performing actions. The Amazon’s Dodge, Evade and Avoid skills have had their chance to avoid damage reduced. Phase Run’s damage has been removed. Valkyrie has been reworked slightly. Her physical damage per level has improved. Her Lightning and Physical damages will now be listed on the skill description. She has a new physical damage synergy from Jab. She no longer uses Phase Run. Decoy has been reworked. Her damage will be listed on the skill description. The skill description will now also show her shared life with you. She now uses your bow’s physical damage. Her duration has decreased and she no longer uses Phase Run. Ice Arrow’s additional arrows have been removed. Immolation Arrow’s post-explosion fire ground will last 2 seconds (down from 4) to reduce visual clutter (the DPS will be unaffected). Immolation Arrow’s burn damage synergy from Fire Arrow has been increased to 16% (up from 14%). Immolation Arrow’s post-explosion ground fire now uses a smaller flame animation to reduce visual clutter. This has no gameplay impact. Exploding Arrow has a new damage synergy from Magic Arrow. Blade Fury has been reworked slightly. The blade travel range has been shortened so that it ends at the edge of the screen rather then kill offscreen. The time delay to shoot another blade while channeling has been increased by 40 milliseconds. The starting mana cost has increased from 1 to 2. The skill now always pierces monsters. Blade Throw’s damage synergies have been reduced from 20% to 16%. Emberstorm’s damage synergy from Fire Blast has been increased from 8% to 13%. Emberstorm has a new damage synergy from Wake of Inferno. Emberstorm's mana cost per level has been decreased from ~0.5 to ~0.25. Fists of Ice/Thunder/Ember have had their charge duration per level increased from 0.52 to 0.72 seconds. Blades of Ice’s damage synergy from Fists of Ice charges increased from 5% to 10%. Static Strike’s damage synergy from Fists of Thunder charges increased from 5% to 10%. Mind Blast’s conversion chance has been temporarily set to 0% until I properly sit down and look at this skill. Whirlwind’s starting attack rating bonus reduced from 40% to 10%. Deadly Strike chance is halved while using Whirlwind. Total Attack Rating is halved while using Whirlwind. Improved the wording on Frenzy’s magic portion to make it clear that it converts physical damage to magic rather than add magic as extra damage. Power Throw’s damage per level has increased from 6% to 8%. Cleave’s damage synergy has increased from 10% to 15%. Frenzy’s starting attack speed has been increased from 5% to 9%. Flame Dash’s mana cost per level has been increased from 0.5 to 1. Volcano’s physical damage synergy has increased from 18% to 19%. Fire Claws’ damage synergies lowered from 19% to 17%. Fire Claws’ mana cost per level now increases by ~0.1 per level (up from 0). Rabies will (hopefully) no longer ignores poison immunity on the initial target. Raise Skeletal Magi’s poison damage duration has been decreased from 2 seconds to 1.5 seconds but maintains the same damage rate. This is a buff… but the damage wasn’t working so does it even count? Raise Skeletal Magi’s cold damage values and scaling has been improved slightly. Blood Golem’s skill description now shows the amount of shared life with the player. Bone Offering’s physical damage per level has been increased from 5% to 6%. Precision aura now starts with an additional +8% piercing attack but only for self (aura owner). The ally (party) bonus remains the same as before. Holy Bolt’s Blessed Hammer synergy has been changed to Sanctuary. Holy Shield no longer shoots Holy Bolts when struck by ranged attacks. Holy Bolt is no longer able to damage the same target three times using the enchantment. Holy Bolt has been improved. It will now pierce all targets (monsters and players) and it damages and heals everything it touches along the way. Sanctuary’s starting bonus damage against undead has been lowered from 150% to 50%. Sanctuary will no longer cause attacks to ignore the physical resistances of undead enemies. Redemption’s chance to redeem a corpse has been lowered by about ~10% at early levels and ~15% at higher levels. Teleport’s mana cost can no longer cost less than 12. Discharge’s damage synergy from Nova has been reduced from 5% to 4%. Energy Shield’s starting absorption lowered from 15% to 12%. Nova’s damage synergies from Discharge has been reduced from 7% to 4%. Nova damage scaling per level at levels 23+ have been reduced slightly. Freezing Pulse now starts at 3 pulses (up from 1). Freezing Pulse now gains 1 pulse every 5 levels (was 4). Blizzard’s physical damage portion has been removed. Glacial Spike’s starting freeze duration has been reduced from 2 seconds to 1. Enchant and Frigerate had their duration increased to 4 minutes (was 3). Blaze has returned but it now leaves a patch of burning ground around you rather than a narrow trail. It also regenerates your life. It will only summon fire while in combat to prevent screen clutter. It replaces Ignite on the tree and therefore takes over the Ignite synergies of other skills. Meteor’s burn damage synergy from Fire Wall has been changed to Blaze. Enchant (skill) has been renamed to Enflame to prevent confusion with the Orb of Enchantment. Meteor’s physical damage portion has been removed. Meteor’s delay before it hits the ground has been shortened by almost half. Meteor’s post-explosion burning ground will now always last 2 seconds instead of scaling from 0.5 seconds to 12+ seconds. Enflame and Frigerate can be cast while in bear form. Enflame and Frigerate duration has been increased to 320 seconds. Fixed a bug which caused Multiple Shot and Strafe to not benefit from the added physical damage per level listed on the skill even though it was properly being reflected in the character sheet. Fixed a tooltip error on Energy Shield showing the maximum absorption as 90% instead of 85%. Due to a bug with the listed poison damage values granted by the partial set bonuses from The Disciple; the poison damage has been changed from “+22 Poison Damage Over 3 Seconds” to “+1 to Poison Skills” for 3 items. Fixed a bug with Freezing Arrow and Magic Arrow’s attack rating appearing higher due to a hidden attack rating bonus that is calculated and shown in the character sheet but in reality does not work at all. The character sheet will now properly show the attack rating (which is the same as Normal Attack). Fixed a bug with Raise Skeletal Magi’s poison damage only dealing a tiny fraction of the listed damage. Fixed a bug which caused Immolation Arrow’s fiery trail to do less damage than the post-explosion fire ground. Fixed a bug with Silence runeword not showing the Cleansing aura in the stats list (though the aura did work). Also fixed a bug which caused the ‘11% Mana Stolen Per Hit’ stat to spawn at 7% instead. Fixed a bug with Fists of Ice/Thunder/Ember’s skill description which showed the charge duration as having about 2 seconds less than was actually the case. Fixed a bug with Ground Slam’s Spear and Javelin restriction not actually being applied. Removed Larzuk who was spawning in the tier 3 map. Changed Flamebellow that was accidentally spawning with oskill 'Twister' because 'Ignite' was removed the game. It will now spawn with 'Flame Dash'. Fixed Frostburn's mana roll which was static at 30% instead of varying 30-35%. Fixed Lightning Bolt enchantment not actually working. Reduced the size of the Infernal Trial area. The Ancients will always spawn with fixed modifiers. Korlic has increased physical damage, Talic is extra fast and Madawc has multiple projectiles. The bonus exp % per player that joins a multiplayer game has been reduced from 50% to 40% per player. Access to map is temporarily restricted for the ladder start however as soon as the servers are online and everything is running smoothly, I will immediately work on and release the mapping content as fast as I can. Lowered cost of gambling arrows and bolts. Arrows and Bolts can now be gambled at the vendors. Arrows and Bolts can now be corrupted. Dangoons Teaching’s Chain Lightning on Hit mod has been changed to on Attack. 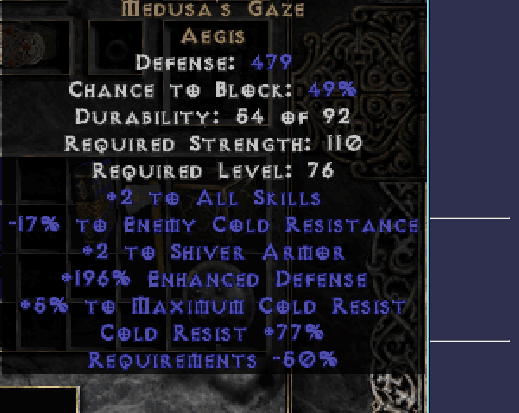 Medusa’s Gaze ‘+2 to all skills’ stat has changed to ‘+2 to cold skills’. Soul Drainer now has the Weaken on hit mod that was removed during the rework. 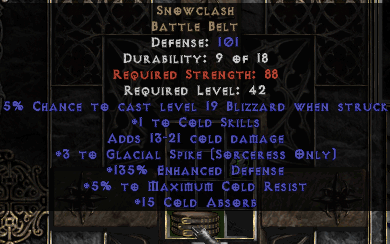 Shadowkiller’s ‘+1 cold damage per ice charge’ has been increased to +(14 to 16). Bloodletter unique sword has the ‘+2-4 sword mastery’ mod changed to the new ‘one hand mastery’ mod instead. Skulls no longer gives ‘reduced magic damage taken’. The ‘reduced physical damage taken’ values have been increased slightly. MA Rework: Charges have benefits while they are active on you even when not using a main/finishing skill. The main/finishing skills do not consume the charges but instead benefit from them while they are active. The kick skills (dragon flight & dragon talon) now benefit from weapon damage instead of boot damage. Martial Arts skills can now also be used with Daggers instead of just Claws. Blade Fury has been reworked. A channeling skill that fires a short ranged blade that pierces enemies. Once it reaches it’s maximum range, it splits into two and shoots towards two nearby enemies and disappears on contact. Undone due to new bug discovered. Blade Shield’s starting duration is now 30 seconds (down from 240). It gains 4 seconds per level (down from 10). All blade skills now synergies with one another and correctly display the damage percentage. Also fixed a bug with some of the synergies not properly scaling the damage. Venom and Deadly Poison can no longer stack. Their duration overrides clash which causes huge damage spikes. Emberstorm’s synergies have been increased. Lowered Emberstorm’s starting mana cost. Static Strike lowered to 80% weapon damage (down from 100%). Various little damage tweaks to Martial Arts to improve balance. Reduced conversion duration on Mind Blast. Shadow Warrior/Master should now be using the new Martial Arts skills properly. Shadow Warrior/Master’s summon cooldown has been reduced from 6 to 4 seconds. Lightning Sentry’s damage synergies increased from 20% to 21%. Lowered Strafe’s starting physical damage. Increased Strafe’s +% damage per level from 5% to 6%. Fire Arrow’s fiery trail duration has been reduced. Immolation Arrow’s fiery trail duration has been reduced. Freezing Arrow now also receives cold damage from Ice Arrow. Ice Arrow now fires 3 arrows (instead of 1). Reduced the visual clutter on Immolation Arrow’s post-impact burning ground. Critical Strike (the Amazon passive) has been renamed Lethal Strike to avoid confusion with the stat of the same name. Inner Sight has been reworked slightly; It is now a passive skill that affects enemies that get near you. This also applies to the Act 1 Mercenary. Frenzy’s movement speed bonus has been reduced. Frenzy’s duration has been increased. Frenzy’s damage synergy from Bash has been changed to Cleave. Frenzy’s damage synergy from Cleave is now 10% (up from 5% from bash). Frenzy now has a new accuracy synergy from Concentrate. Whirlwind’s damage per level has decreased from 7% to 6%. The chance to apply crushing blow via Whirlwind will now be halved due to Whirlwind’s high attack rate. Flame Dash's minimum cooldown increased from 0.4 to 0.5 seconds. Lowered Hurricane’s top end damage scaling. Fire Claw’s synergies have been reduced to 19% (from 20%). Oak Sage’s starting life bonus from 18% to 12% (was 20% with bug). Oak Sage’s radius per level has been increased. Raven’s physical and cold damage values at low levels have been reduced slightly. Raven’s cold damage synergy from Hurricane has been removed. Raven’s cold damage synergy from Arctic Blast has been increased from 13% to 20%. Raven’s now receives 1% cold damage per Energy. Raven’s mana cost per level has been increased from ~0.4 to ~0.5. Raven’s starts with maximum of 2 ravens at level one (down from 3). Convocation's minimum cooldown increased from 0.4 to 0.5 seconds. Raise Skeletal Mage can now summon all four elements (was fire-only last patch as temporary fix). Cold, Lightning and Poison damage has been rebalanced to match fire’s power. Raise Skeletal Mage’s fire damage synergy from Fire Golem has been changed to Bone Offering (and scales all elements). Bone Spear now receives 1% magic damage per 2 Energy. Bone Spear’s starting damage and damage per level has been reduced at all levels. Desecrate’s mana cost per level has been increased from 0 to 0.2. Teeth’s damage synergies decreased from 20% to 19%. Poison Nova’s damage synergies have been increased from 12% to 13%. Poison Nova can now be assigned to left click. Sanctuary no longer grants +% magic skill damage. Dashing Strike’s cooldown has been reduced from 7 to 6 seconds. Blessed Aim aura now also grants a small amount of flat attack rating. Charged Bolt now gains an extra bolt every two levels (instead of every level). Decreased Hydra’s Fire Ball damage synergy to 2% (resulting in 1% increase due to bug). Reduced Hydra’s damage per level at higher levels (level 17+). Energy Shield is now capped at 85% absorption (down from 90%). Energy Shield now starts at 15% (down from 20%). Teleport now lowers your defense rating for 0.3 seconds while teleporting. Freezing Pulse’s damage synergies increased from 3% to 4%. Frost Nova ‘s damage synergies increased from 20 to 21%. Fixed a client-side bug with Warmth and Critical Strike not immediately showing the correct values to the players, when increased or decreased. Fixed a bug with Azurewrath not correctly showing the Sanctuary aura on the item’s stat list. Fixed a long standing bug with Bash’s added flat damage which never actually dealt extra damage but still counted for some formulas like Life Leech calculations. This allowed the player to receive added leech off of non-dealt damage, even if the target was immune. The broken flat damage has simply been removed. Fixed a bug with Mercenaries not turning on their aura immediately. Fixed a bug which caused Hydra’s Fire Ball damage synergy to increase damage by 1% per level (instead of 4%). Fixed a bug which prevented players from putting TP scrolls into the TP book via the inventory. Fixed Bone Armor not being able to stack with Shiver/Chilling Armor. Fixed a bug which caused Oak Sage’s +life% to allies to actually use older values (20% instead 18% at level 1 and 5% per level instead of 4%). Fixed an accidental change to Razortail from last season. It will have 33% pierce like before. Fixed the Skeletal Magi not being the same color as their element. Fixed Raise Skeletal Mage not showing the new synergy. Fixed a bug with Fists of Ember/Ice/Thunder which caused them to not actually deal listed damage. Fixed some minor text errors on skill descriptions. Fixed a bug with Blade Fury and Blade Throw. Fixed a bug which caused multiple shot’s added physical damage from not showing on the skill description. Fixed Blades of Ice’s skill description which incorrectly listed 100% weapon damage (its always been 50%). Diablo Clone has returned… but you must fight him in his domain... details coming soon! Council Members can no longer spawn with Fire Enchanted. There is a old bug in the game code that makes them deal insane damage in Nightmare. The Ancients can no longer spawn with Fire Enchanted. Talic now uses a lower level Whirlwind. Root of All Evil boss now uses Dashing Strike instead of Flicker Strike. His AI has also improved especially when hunting down ranged players. Uber Baal is now immune to curses. Fire Enchanted monsters in Nightmare will deal 30% CE instead of 35%. This is a temporary fix to an old bug blizzard never fixed which makes Nightmare do a lot more CE damage than they should. Monster’s resistances can no longer go below 0%. Maggot Lair now has two levels (down from 3). The boss room is also larger. Coldworm the Burrower now spawns maggot infinitely and has a random aura. Arcane Sanctuary’s pathways are now larger. A new area called The Ancient's Temple has been added. You will now bring relics to this area instead of the previous area. It requires level 80 to enter. The entrance is in Act 5 town. Relics will now be right clicked to activate (while standing in The Ancient's Temple). All party members in the temple area will be warped with you into the dungeon. Using a town portal while in a relic dungeon will warp you to town without creating a portal. It will be impossible to re-enter the dungeon. Crushing Blow will have reduced effectiveness on prime evils and relic bosses (value to be decided). The “% increased magic damage” mod has been renamed “% increased magic skill damage” to help communicate to players that it only affects magic damage skills and not magic attack damage on gear. Lower drop rates of all runes, especially higher ones. Upgrading Runes will no longer require gems. Antidote and Thawing potions no longer grant bonuses to maximum resistances. Lowered the prices of throwing weapons and quivers which had gone up unintentionally due to increasing the stack sizes in a previous patch. Orb of Corruptions are slightly rarer. Orb of Corruptions now only start dropping at monster level 40 or higher. Guardian Angel’s bonuses to maximum elemental resistances has been reduced from +15% to +7%. Guardian Angel now also gives +10-15% to all resistances. Guardian Angel’s attack rating bonus against demons has been changed to an attack rating bonus against all monster types. 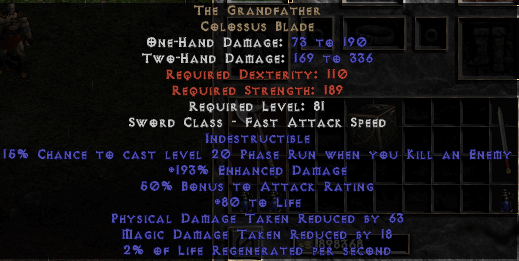 The Grandfather unique sword has gone back to its original stats but has kept the 2% Life regeneration. Stone Runeword no longer grants an additional grizzly bear and golem. Chaos Runeword’s ‘+1 to Whirlwind’ has been changed to ‘+1 Zeal’. Wisp Projector’s “10% Reduced Skill Cooldown” stat has been replaced by it’s original stat; Heart of Wolverine charges. Wisp Projector gained a new stat: 4-8% faster run/walk. Blade Fury is now affected by piercing attack. Blade Fury’s hitbox is a little wider. Blade Shield now starts with 1 blade at level 1. It will gain an additional blade every 10 levels. Crimson, Ocher and Cobalt Strike gained slightly more duration per level. Crimson, Ocher and Cobalt Strike gained more elemental damage per level. Blade Shield’s tooltip now shows the duration. Fade’s curse duration reduction has been reduced significantly. Decoy has been reworked. It uses Multiple Shot skill. Valkyrie has been reworked. It uses Charged Strike skill. Battle Orders’ bonuses have been split into two: Self and Allies. The buff given to allies is much weaker than the one the barbarian receives himself. Reverted in hotfix due to irreparable bugs. Barbarian’s Masteries have been changed. There are no longer weapon specific masteries. Instead there is Two Hand, One Hand and Throwing. Throwing Mastery no longer has critical strike chance. Bash’s starting magic damage conversion has been reduced from 70% to 45%. Bash’s base damage has been lowered from 130% to 110%. Cleave’s starting mana cost has been reduced from 5 to 4.5. War Cry’s synergies have been increased from 15% to 16%. Ethereal Throw’s weapon damage percent has been reduced from 65% to 60%. Rabies’ poison duration has increased to 4 seconds. The damage has been scaled up accordingly. Rabies’ infection spread AoE has been increased. Ravens can no longer be summoned in town. Ravens no longer warp to you when changing areas or teleporting too far away. Hurricane’s damage synergies have been reduced from 5% to 4%. Tornado’s damage synergy from Cyclone Armor has been reduced from 12% to 7%. Druid’s Fire Claw skill has been changed to deal 100% of fire weapon damage as splash damage. Werewolf form now starts with 15% increased life (was 25%). Werebear form now starts with 25% increased life (was 35%). Shock Wave’s damage synergy has been lowered from 11% to 10%. Flame Dash has been reworked. The cooldown is reduced by base levels. The damage is scaled by levels and energy. Raise Skeletal Mage now receives a damage synergy bonus from Fire Golem. Fire Golem’s mana cost per level has been reduced by 2. Flesh Offering and Bone Offering now have a larger Area of Effect. Bone Offering no longer reduces magic damage taken. Bone Offering now gives increased damage. Desecrate’s poison cloud AoE is now larger and travels faster. Life Tap’s heal has been reduced to 25% at level one and returns to 50% by level 13. Holy Fire’s damage scaling has been reduced. Smite’s mana cost has been increased from 2 to 4. Removed Holy Shield’s strength synergy to smite damage. A new Sorceress fire skill has been added: Ignite. Static Field minimum cap on monsters has changed to 25% on Normal (was 0%), 50% on Nightmare (was 33%) and 75% in Hell (was 50%). This means Static Field stops working when a monster’s health is at 25%/50%/75% of max hp. Hydra now has a maximum cap of 4 sets of hydras alive simultaneously. Hydras now shoot fire balls instead of fire bolts. Hydra now has a fire ball synergy. Hydra’s starting duration has been increased slightly. Warmth now also gives percent attack rating. Immolate fire damage synergy has been reduced from 7% to 6%. Immolate’s radius has increased from 5 to 7 yards. Lightning Mastery’s bonuses have been increased. Fire and Cold Mastery have had their bonuses adjusted slightly. Discharge’s starting cooldown has been reduced from 10 to 8 seconds. Discharge’s minimum cooldown has been reduced from 5 to 4 seconds. Discharge now receives a damage synergy bonus from Static Field. Discharge’s synergies are now 5% (Nova was 8%). Discharge’s starting damage has been reduced. Discharge’s projectiles now travel faster. Fixed Bone Armor’s bone spirit synergy not showing the absorption increase on the skill tooltip. Fixed a bug which caused Feral Rage’s life leech to not work. Fixed an issue which caused +% Increased Magic Damage mod to not apply to conversion skills like Magic Arrow and Bash. Fixed a bug which made ‘+% Increased Magic Damage’ mod work as an additive bonus to synergies rather than multiplicative. Fixed a bug which could cause some players to crash in Arcane Sanctuary or while wearing Trang-Oul’s Avatar set. Fixed an issue with the font that made the number ‘5’ look like a ‘6’. As a temporary fix to the Raise Skeletal Magi skill, only the Fire version will spawn. This temporarily addresses the issue with the fire magi being the strongest one and requiring summoners to desummon the other *elements. Fixed a bug which made the Den of Evil quest impossible to complete after using the Desecrate skill. Fixed a bug which caused elemental damage dealt by Revives to not get increased by Summon Mastery. Fixed a bug on non-ladder that caused players to gain zero experience and monsters to have 1 hp. 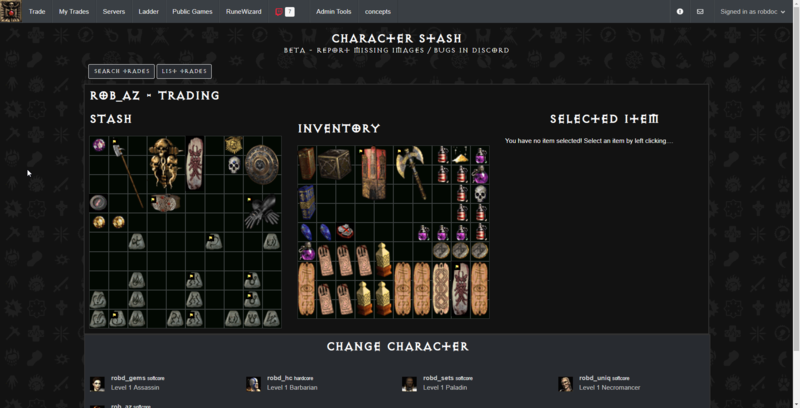 Loot filter: Make your own or use the community made ones. Fast Self-Muling: Perming games now takes 30 seconds. 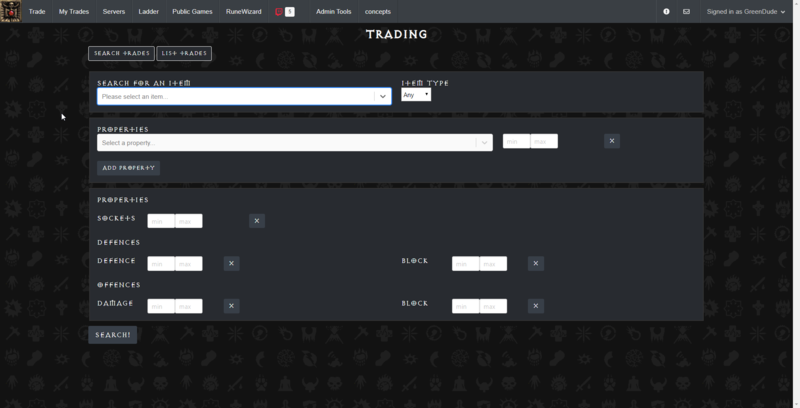 Quickly move items to stash or ground via control/shift right click. Inspect the gear of allies. Advanced Character Sheet: see many stats you couldn't see before. Remembers your previous Game Name and Game Server. Automatically party up/permit loot when players join game. The “First to reach level …” announcements are now working. We now have 14 game servers located around the world to give you better ping. Paid for by the community. Act 5 Barbarian (Merc) now use Might aura. The Act 3 Iron Wolves (Merc) no longer cast spells. Instead they use Vengeance (their own version with reduced multipliers). The cold Iron Wolf (now called offensive) now has Meditation aura. The fire Iron Wolf (now called combat) now has Thorns aura. The lightning Iron Wolf (now called defensive) has Cleansing aura. The Nightmare versions of the Act 2 Mercenaries are now the same as their Normal and Hell difficulty versions. This means the Holy Freeze, Thorns and Might auras are now Prayer, Blessed Aim and Defiance. The Act 5 Barbarian (Merc) now always uses Bash (converts 70% of phys to mag). He no longer can use Stun. 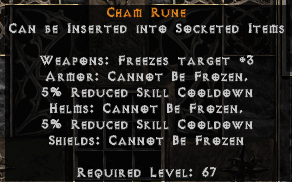 Cham rune now gives 4% Skill Cooldown Reduction. Enigma’s runes have been reverted back to JahIthBer. Enigma’s life on kill stat has been replaced by 19% chance to gain Slow Time when hit. Infinity’s enhanced damage stat has been reduced. Ethereal armors no longer work with the unsocket cube recipe. This is a temporary fix to the eth bug that allows a chest piece to maintain the defense rating stat. Stone runeword no longer offers Cleansing aura. Silence runeword now has level 8 cleansing aura. Martial arts tree has been partly redone. In the end I cut out some skills due to new bugs that were discovered with not enough time to solve them. I do not recommend players use this tree. Blade Shield has been completely reworked. Death Sentry’s corpse explosion life percentages have been reduced. Moved Phase Run’s icon in the skill tree because it was on the wrong row. Penetrate is now a level 12 skill. Plague Javelin’s damage synergy has been increased. Freezing Arrow’s damage synergy has been increased. Phase Run’s damage scaling and starting duration have been increased slightly. Ground Slam’s base damage has been increased slightly. Ethereal Throw’s base damage has been reduced slightly. Ethereal Throw’s magic damage scaling especially at early levels has been increased slightly. Frenzy’s base damage has been increased. Leap no longer knocks back. Cleave’s base damage has increased. Cleave’s mana and mana scaling costs have decreased. Cyclone Armor no longer has any synergies. Hurricane’s damage synergies have been decreased slightly. Tornado’s damage synergies have been decreased slightly. Volcano’s physical damage synergy has been increased. Rabies’ poison damage length has been reduced from 6 to 3 seconds. Rabies damage has been increased significantly. Rabies now has receives a damage synergy from Summon Dire Wolf. Poison Creeper no longer has Rabies as a synergy. Shock Wave’s base damage has been reduced slightly. The bonus life in Werebear form has been reduced. Some of the Necromancer skills have moved around on the skill tree. Bone Spirit is now a level 24 skill. Bone Prison has been removed from the game. Blood Golem’s life leech has been reduced. Bone Armor’s Bone Prison synergy has changed to Bone Spirit. Corpse Explosion’s corpse life percentages have been reduced. Blood Golem no longer has 100% chance of open wounds. Salvation aura now also increases your party’s elemental damage. Sanctuary aura now gives +% To Magic Skill Damage. Prayer aura now also heals for 1% of your maximum life at all levels. Charge’s base damage and starting bonus damage has been decreased. Charge’s damage synergy and chance to hit scaling has been increased. Discharge’s top end damage scaling has been reduced. Discharge’s nova synergy has been reduced. Discharge’s damage bonus from energy has been reduced. Enchant’s damage synergy has been increased. Frigerate’s damage synergy has been increased. Fire, Cold and Lightning Masteries have had their damage increased but their resistance pierce lowered. Meteor’s impact damage now deals additional physical damage. Blizzard now deals additional physical damage. Hydra’s duration has been reduced slightly but it also slightly increases with levels. Fixed the game server field requiring lowercase. Fixed a bug which occasionally caused the game to crash while switching characters/games. Third attempt to fix the Flame Dash visual bug in Multiplayer. Again this is purely a visual effect bug that does not actually impact the gameplay but I still hope I finally fixed it. Fixed a bug which showed Sanctuary aura gaining radius in levels when it was not the case. Fixed a bug which caused Ravens to have a lower attack rating than planned. Fixed a bug with Raise Skeletal Mage which caused their damage values on the tooltip to be wrong when Minion Damage was level 0. Fixed a bug with certain trap chests and the chest in forgotten tower. These new servers will require a new account. Make sure your characters are on Ladder. And don't forget to add "chat" to your friendlist to join global chat. We are testing out a new announcement system that will globally announce player achievements like first to reach levels and also top 50 deaths. We are trying out automated daily restarts to help server stability. Assassins now start with two katars instead of one katar and buckler. Relic bosses will no longer spawn random mods. They will always spawn with the same mods. Relic bosses have been tagged as prime evils. Relic bosses will always drop a relic. Relic bosses are now 5 levels higher than the area level. Relic bosses now have new skills which makes their fight more interesting and dangerous. A new relic (tier 4) has been added to the game. Relic boss rooms will now have more shiny chests as you climb the tiers. Stony Tomb in Rocky Waste has been changed. It is smaller but more rewarding. Monsters that cast the Blood Mana curse will now instead cast a new curse which lowers maximum resistances. 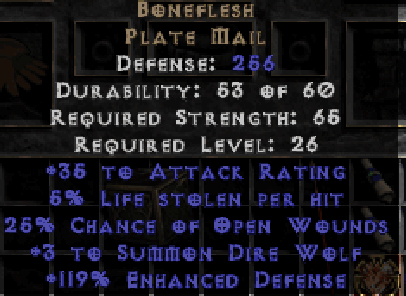 Bone Fetish’s maximum pack size has been reduced by one. Arrows and Bolts have been reworked. They can now drop magic or rare with a wide variety of mods. Orb of Corruptions no longer work on white items. 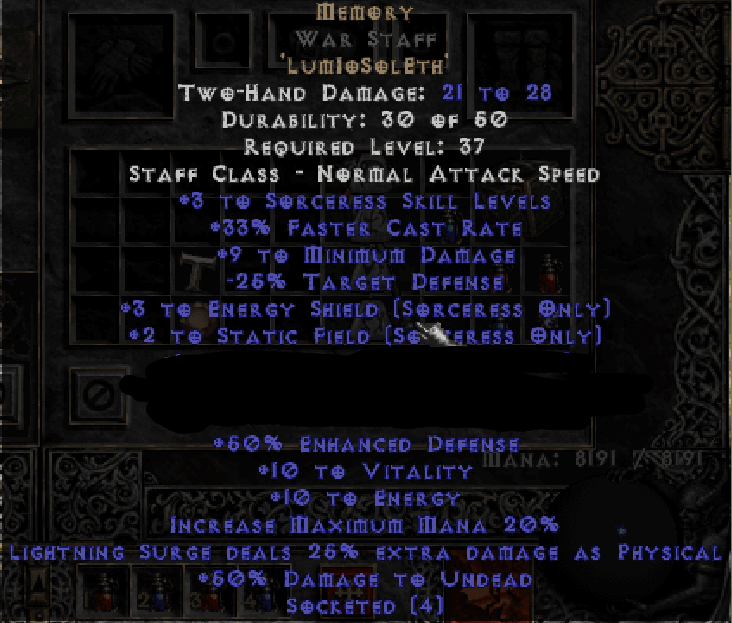 Orb of Corruptions drop a little less often. A few mods granted by Orb of Corruptions have changed. This is a buff. Greater life potions now heal for 200 (up from 180). The Phoenix runeword no longer has a chance to cast Firestorm. The spirit runeword (sword version) has been changed. The vitality is removed. The mana and faster cast rate are based on character level. Items that give auras when equipped will now always give the same aura level. Items that have auras also sometimes lost one minor property to allow room for this change. To learn more about the reason for this change, click here. Fade's curse resistance has been reduced. Wake of Fire’s synergy is now more effective. Freezing Arrow’s synergy is now more effective. Immolation Arrow’s burn damage at impact has increased to match the fiery trail damage. The burn damage synergy has also increased (affects impact and trail burn). Fire Arrow now has a burn damage synergy from Explosive Arrow. Ground Slam shoots out less projectiles but the area of effect on impact will increase with levels. Added a new Barbarian skill: Cleave. Combat skills tree has changed slightly. Some skills have had their level requirements changed. Bash now deals 130% base damage. Bash now starts at 70% physical to magic damage conversion and increases with levels. Ethereal Throw's base damage has been reduced slightly. Ethereal Throw's magic damage synergy has been reduced slightly. War Cry’s damage synergies are now more effective. Molten Boulder’s fire and physical damage synergies are now more effective. Volcano’s physical and fire damage synergies are now more effective. Lycanthropy’s starting life bonus has been reduced. Firestorm’s travel speed has been reduced significantly. It will now gain travel speed with each level. The quantity of Spirit and Dire Wolves that you gain is now based on hard points. Oak Sage’s starting values and scaling has been reduced slightly. Oak Sage is now a level 12 skill. Spirit of Barbs is now a level 30 skill. Raven’s starting mana cost has been reduced slightly. It will now scale up slightly with levels. Flame Dash has been reworked slightly. This should fix the animation bug it suffered from. The cooldown is also changed. Blood Golem’s leech now shares less life with his owner. Teeth’s damage has been slightly reduced at lower levels. Bone Prison has been temporarily made unusable. You can still level it for the Bone Armor synergy. Deadly Poison now deals poison damage over 2 seconds. Deadly Poison’s synergies are now more effective. Thorns aura has been changed to Precision. Sanctuary no longer knocks enemies back. Sanctuary’s magic damage now works on all monsters. Holy Shield’s bonuses to Smite have been improved. Holy Shield’s smite damage now increases from Strength. Blizzard's synergies are slightly more effective. Freezing Pulse's damage scaling has been lowered. Freezing Pulse’s synergies are now less effective. Freezing Pulse’s mana cost now increases with levels. Frost Nova’s synergies are now more effective. Enchant and Frigerate will no longer gain duration with levels. They will always last 3 minutes. Fixed a bug which caused rare circlets to turn into a rare hand axes when using the normal to exceptional upgrade recipe. Fixed a bug which caused Ravens to only deal splash damage in normal difficulty. Fixed a bug which made Phase Run’s cast time still use cast speed instead of attack speed. We are introducing a new dungeoneering system that will significantly improve the current one we have in place. The current dungeons will be reverted back to normal. So what is the new system? Players will find Relics which are tiered. When a player finds a relic, he can bring it to an Altar and use it. This will create a portal to a high level dungeon. These dungeons are exclusive to the end-game. They are inaccessible until Hell and require level 80 to open. These dungeons offer an optional alternative end-game aimed for high level characters (90+) where they can farm difficult content for experience and loot. These areas become harder and harder as you climb the Tiers. Each map has a boss and currently you are required to kill the map boss in order to gain access to higher tiers. Dungeons get increasingly difficult as you enter higher tiers but they will provide excellent experience points. These dungeons are safest when done in a group. It is not recommended to enter solo unless your character has end-game gear. Please be advised that the map bosses can be pretty scary. Tread carefully. There is currently 3 tiers out of the planned 5. The other tiers will be patched in later due to time constraints. Please make sure to send in feedback on the dungeoneering system so that it can be further improved in the upcoming patches. Monsters can no longer spawn with the Mana Burn mod. Moved “Flamespike the Crawler” further away from the Inner Cloister waypoint. Increased the drop rate of Tier 1 maps. Arrows and Bolts now spawn with a wide variety of implicit mods. Healing potions have been renamed to Life potions to shorten their name label, resulting in slightly less item clutter on screen. The “Damage Taken Goes to Mana” mod will now read “Damage Taken Gained as Mana when Hit” to avoid confusion. The mods “Damage Reduced by” and “Magic Damage Reduced by” will now read “Physical Damage Taken Reduced by” and “Magic Damage Taken Reduced by” to avoid confusion. Increased the drop rate of Orb of Corruptions. Diamonds socketed into Weapons will now give “Adds x-y Damage” instead of “% Damage vs Undead”. Skulls socketed into Shields will now give “Physical/Magic Damage taken Reduced by X” instead of “Attacker takes damage of X”. Activating Phase Run is now based on your attack speed instead of cast speed. Phase Run’s additional duration per level has been increased. Fire Arrow and Immolation Arrow’s fire trail now uses smaller animations to reduce the visual noise of those skills. This is a visual-only change that does not impact the skill. Berserk skill has been reworked. Battle Command’s base duration has been increased. Battle Command will now grant +2 to all skills at base level 10 and +3 to all skills at base level 20. Bash now converts damage to magic. Leap Attack can no longer be assigned to Left click mouse button. This is a temporary fix for a bug which allowed the skill to deal the damage without performing the attack animation. Summon Spirit Wolves and Summon Dire Wolves now gain one wolf every two levels instead of one every level. Oak Sage now requires level 30. Heart of the Wolverine now requires level 6. Raven’s attacks now deal splash damage. Raven’s cold damage has been reduced slightly. Raven’s maximum Ravens count is now 20 instead of 28. Firestorm’s damage has been reduced at lower levels. Spirit of Barbs now requires level 18. Blood Golem now has an aura that grants allies "Life gained on hit". Sanctuary now properly grants Phase Run charges. Holy Shield now releases bolts of magic when hit by enemy missiles. Holy Shield now has a Holy Bolt damage synergy. Fist Of Heavens no longer forces you to attack when out of mana. “Lightning” skill has been renamed “Lightning Surge” to avoid confusion. Energy Shield’s tooltip will now show you the efficiency percent. Hydra’s damage has been reduced. Hydra now receives a damage synergy from Warmth. Freeze Pulse’s synergies have been reduced. Freeze Pulse’s damage scaling has been reduced. Fixed the name label of gems. Fixed a bug with Fire Arrow not properly requiring Magic Arrow to level the skill. Fixed a bug with Immolation Arrow’s fire trail which caused it to deal weapon damage. Fixed a bug with Battle Orders showing “50% reduced effectiveness” when the skill level was zero. Hopefully fixed a bug that caused Flame Dash’s animation to play in the wrong place, only when playing online. This fix cannot be confirmed as working until tested on the server. This was a visual-only bug and therefore will not affect gameplay if the bug persists. Fixed a bug which caused Gull dagger to spawn with Righteous Fire. Fixed a bug which allowed Find Item to unintentionally get extra relics from dungeon bosses. Fixed an error on Raven's skill description which showed a Tornado synergy instead of Twister. Fixed a bug which allowed Heavenly Garb to spawn with +5 Energy Shield. The Grief runeword's bugged damage has been replaced by damage based on character level. This has helped fix the tooltip error. The Cow King will no longer spawn in the Secret Cow Level. (This is a temporary change until he can be modified to not disable Cow Level creation upon his death). Added a Move Only option that can be assigned to left click. Allows players to move around without attacking or casting accidentally. Changed the font color of certain item types which will help players quickly see what items they want to pick up or leave behind. Areas which are part of the dungeoneering system have now been marked to warn uninformed players of their danger. Gargantuan Beasts in Halls of Pain have been given an aura that slows players. The Amazon’s starting attack rating has been increased slightly. The Amazon’s life gained per level has been increased slightly. Normalized the drop rate of Orb of Corruptions so they drop more consistently at all levels instead of dropping much more often in the early game. Some of the stats spawned by Orb of Corruptions have been buffed while others have been changed to different and better stats. This should make the implicit stats more appealing. The odds of getting additional sockets via Orb of Corruptions remains the same, however the odds of getting more than two sockets has been reduced. 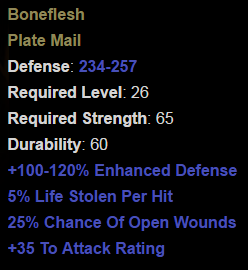 The Strength Runeword gained the new mod "7 Life Gain on Melee Hit". 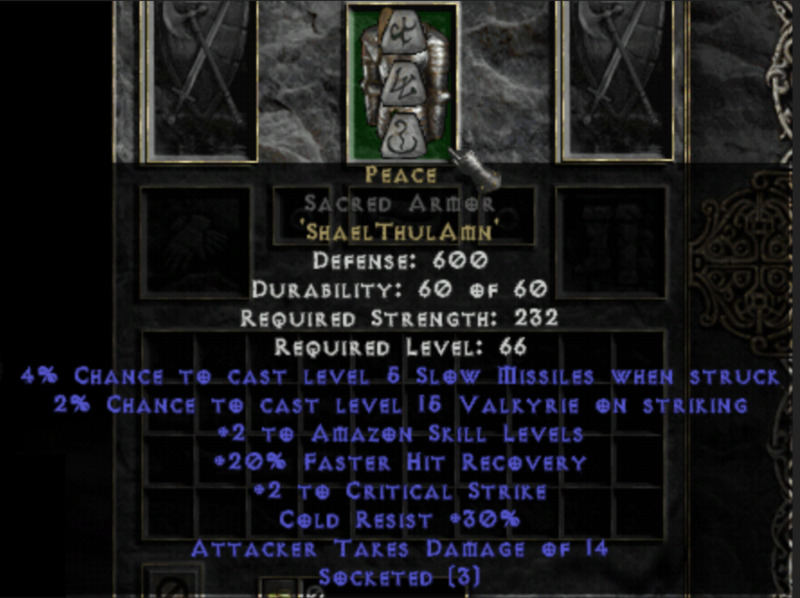 Angelic Sickle gained "1-9 Lightning Damage". The Zephyr Runeword's "7% chance to cast lvl 1 Twister when struck" has been replaced with "+3 Phase Run". Milabrega's Rod gained an additional stat "15% Increased Lightning Damage". The unique item Steel Shade has been reworked. 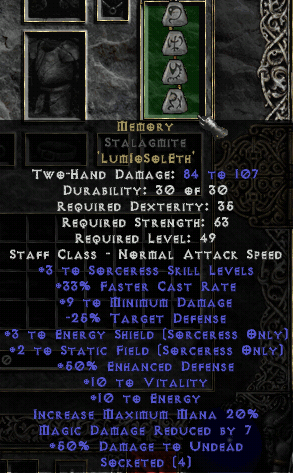 The unique item Radament's Sphere has been reworked. The set item Dangoon's Teaching has been reworked. Evade/Dodge/Avoid passive skills have had their recovery animation speeds doubled. Ground Slam’s waves quantity formula has changed so that it is now worth maxing out to get more waves. Added a fire trail to Fire Arrow that burns enemies. Fire Arrow is now a level 6 skill. Cold Arrow is now a level 1 skill. Added a fire trail to Immolation Arrow that burns enemies. Explosive Arrow is now a level 24 skill. Explosive Arrow’s damage has been increased. Immolation Arrow’s damage has been increased. Immolation Arrow’s burning ground damage synergy has been increased. War Cry’s stun duration has been reduced. War Cry’s damage synergies have been reduced. Battle Orders, Shout and Battle Command have had their base duration and duration per level increased. They no longer have duration synergies. Ethereal Throw’s magic damage has been reverted back to a previous version due to being incorrectly increased while it did not function properly. Ethereal Throw’s weapon damage has been reduced slightly to account for the new magic damage it now deals. Throwing Mastery’s piercing attack chance has been reduced. Werebear’s life bonus has been reduced. Molten Boulder’s speed has been increased. Deadly Poison is now a level 1 skill. Bone Armor now requires Teeth. Raise Skeletal Mage’s damage at early levels has been increased. Increased the Smite Damage on low level shields by about 20%. Hydra’s duration has been decreased slightly. Hydra’s damage per level at higher levels (23+) has been reduced slightly. Hydra's mana cost per level increased slightly. Nova’s damage synergy has been increased. Glacial Spike now has Freeze Pulse as a damage synergy. Fixed a bug with Convocation’s tooltip which showed the wrong cooldown time when in Nightmare and Hell difficulty. Fixed an error on certain tooltips that still referred to “Poison Dagger” instead of the new “Deadly Poison” name. Fixed a bug that caused Ethereal Throw’s magic damage to never actually deal any damage. Fixed a bug which caused Occulus to drop without the teleport when hit mod. Fixed a bug which allowed Orb of Corruptions to be used on items that had already been corrupted previously. 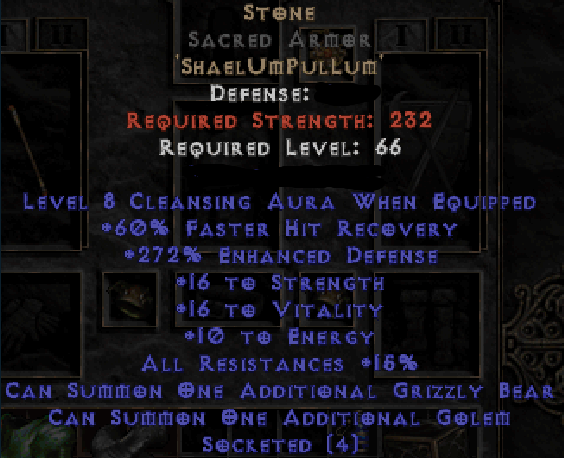 Fixed a bug with Uber Andariel, Uber Duriel and Uber Izual which allowed them to very rarely drop an Annihilus. Fixed a bug that caused Ground Slam and Ethereal Throw to play a lightning damage sound even without any lightning damage on the character. Global chat system. Visit the “CHAT” tab of this subreddit to find out how to join the channel. Improved ping for European players. You can expect an improvement of about 20-30ms. Improved detection and prevention against some cheating software. Players can see their character avatar in the lobby. The server can now handle more concurrent players. You may now create up to 18 characters per account. All classes now start with +100 stamina. Barbarians now start with a Hand Axe in each hand instead of one + buckler. Hellfire Torch no longer casts Firestorm on Hit. Heart of the Oak no longer gives Level 14 Raven charges. Marrowwalk has been fixed. It now grants +1 to +3 to Minion Health and +1 to +3 Minion Damage. Significantly increased the max quantity of Throwing Weapons, Javelins, Arrows and Bolts. Added Life to Enigma. This is because the rune change from a previous patch made it lose it’s life bonuses unintentionally. Inner Sight’s duration has been changed to 8 seconds. Inner Sight’s radius has been changed to 16 yards at all levels. Inner Sight no longer has a mana cost. Ethereal Throw now deals 80% weapon damage. Ethereal Throw’s synergies are now much more effective. War Cry no longer has Howl as a synergy. War Cry’s two remaining synergies have had their effectiveness increased. Added a visual effect to Grim Ward’s aura. Shock Wave has been redesigned. It is now a mix between the vanilla version which provides flat damage per level and stun, combined with a portion of your weapon damage. Poison Dagger has been reworked into Deadly Poison. Deadly Poison’s description reads: coats your weapon in deadly poison and increases the potency of your poison skills. Fist of Heavens’ mana cost has been reduced. Blessed Hammer’s synergies are now slightly more effective. Glacial Spike’s mana cost has been reduced by 1. Frost Nova’s mana cost has been reduced by 1. Frost Nova’s Frigerate synergy has changed to Ice Blast. Frost Nova’s synergies are now much more effective. Shiver Armor’s damage synergy is now Frigerate instead of Chilling Armor. Shiver Armor and Chilling Armor now receive more damage from their synergies. Shiver Armor and Chilling Armor now have a longer base duration instead of receiving duration as a synergy bonus. Chilling Armor’s damage synergy is now Ice Bolt instead of Shiver Armor. Cold, Fire and Lightning Mastery have had their starting resistance pierce reduced slightly so that reaching 100% pierce now requires skill level 25 instead of 19. Cold, Fire and Lightning Mastery now also gain 1% elemental damage per 2 levels. Fixed memory leak issues which forced us to reboot the server daily. Fixed a bug with Blade Throw dealing 50% less damage when holding a two handed weapon. Fixed a bug with one of Blade Throw’s synergies not increasing damage properly. Increased monster level of all dungeons by 2. Increased quantity of rare monsters in dungeons. Area size increases to Halls of Pain/Vaught have been reverted due to errors. Lightning spell from boobytrapped chests has now been disabled. Added a new crafting item “Orb of Corruption”. Place in cube with an item to corrupt it. Transmute twice to confirm. The life provided from Call to Arm’s Battle Orders is half of what a Barbarian's Battle Orders provides at the same level. Blade Sentinel has been replaced with Blade Throw. Lightning Fury’s synergy bonus from Lightning Bolt has been increased by 2% damage per level. The nerfs to Pierce skill have been reverted. Raven’s synergies are now slightly more effective. Raven’s maximum ravens count increased from 25 to 28. Volcano’s 1 second cooldown has been removed. Hydra’s cooldown has been reduced. This patch contains some changes to the end-game in an effort to make more areas worth exploring. It is important to offer more replayability via build diversity, but another way to achieve that is to give players more reasons to visit underused side areas. Before this rework, very few side areas were worth visiting, but a notable exception is ‘The Pit Level 2’. This zone is famous for having an equivalent monster level as the Throne of Destruction which means players can get the same item drops but with lower risk since that zone contains weaker monsters. The advantage of Throne of Destruction on the other hand is that it offers both the best drops and the most experience in the game. Although there are a few other notable examples like Countess farming, most other zones in the game are virtually useless to farm. The rework of the end-game plans to address this in a way that should be familiar for Path of Exile players; a mapping/dungeoneering system. We’ve changed some side areas to be completely new dungeons that offer higher monster level for more experience gain, however the content’s difficulty has also increased. The Hole Level 1 now has a monster level of 87. The Hole Level 2 now has a monster level of 88. Stony Tomb Level 1 now has a monster level of 87. Stony Tomb Level 2 now has a monster level of 88. Halls of Pain now has a monster level of 87. Halls of Vaught now has a monster level of 88. All dungeons have had their area size increased. Due to an unforeseen bug, some areas will remain their normal size until we patch a fix some time after the ladder reset. Each dungeon contains a varied list of monsters that can spawn in them, in a multitude of combinations. The item drops within dungeons are the same as Worldstone Chamber. This is the first part of the end-game rework. Don’t forget to give us feedback on these new dungeons. We want to make sure that this system is working perfectly before we can implement the remaining dungeoneering/mapping system. When an Act 5 monster rolls ‘Junk’ (consisting of keys, throwing potions, TPs, IDs and small gold stacks) to drop, it will instead drop nothing about half the time. This change does not affect other drops. Players should now notice less item clutter in the Throne of Destruction. The mod ‘Piercing Attacks’ now specifies the pierce chance percentage in the tooltip. The new mod ‘Righteous Fire’ found on ‘Todesfaelle Flamme’ deals 45% of your maximum Life per second as Fire Damage to enemies around you. Raven now starts with a maximum of 3 ravens instead of 1. Raven now has a cap of 25 Ravens. Raven’s movement speed has been increased significantly. Hurricane's synergy bonus from both Twister and Tornado reduced from 12% to 6% damage per level. Hurricane now receives a 6% synergy bonus from Arctic Blast. Tornado’s synergy bonus from Cyclone Armor has been reduced from 20% to 14% damage per level. Poison Creeper’s damage lowered at early levels. Oak Sage’s Life bonus now starts at +20% instead of +30% at level 1. Convocation has changed: At Level 1 the cooldown is 10 seconds. Every level reduces the cooldown by 0.2 seconds. The cooldown is locked at a minimum of 2 seconds. Teeth’s projectiles emitted at exactly the same time can no longer hit the same target. Teeth’s damage has been doubled. Blood Golem has been given the mod: 100% chance to Open Wounds. Blood Golem’s attack damage increased by about 30%. Iron Golem's base life has been reduced in Hell. All golems now receive bonus life from levels. Fixed an error with ‘Bartuc’s Cut-throat’ tooltip not displaying the item name. Strafe & Multishot have had their weapon damage % reduced in exchange for a new flat damage which increases with levels. This aims to help bow users in the early game when bows are weaker, until they can equip a good unique or runeword bow in late game. Raven has been reworked completely to make it a viable build on its own. Armageddon’s projectiles fall rate is increased by 60% for more consistency in the AoE. Armageddon’s fire damage has been reduced. Hurricane and Armageddon can now be used at the same time. Poison Creeper’s damage has been buffed significantly. The cooldown given to Volcano after casting Armageddon has been removed. Volcano’s physical damage portion has been buffed. The synergy bonus received from Molten Boulder is also slightly more effective. All Golem types have had their life values improved. Poison Dagger: added 1% synergy with Poison Explosion and Poison Nova. Raise Skeleton: Increased damage scaling. Raise Skeletal Mage have had their damage increased. Their damage can now be seen on the tooltip for Lightning, Fire and Cold. Fire Golem had flat fire damage and also ran Holy Fire aura, giving him another flat fire damage, causing double dips in his damage. This has been fixed to where his flat fire damage no longer exists. His Holy Fire level was reduced slightly. Teeth now shoots a maximum of 12 missiles. The damage scaling at high levels has been reduced slightly. Bone Spear’s synergy bonus from Bone Spirit has returned. Poison Explosion’s base radius increased by 50%. Concentration’s damage amplification it provides to Blessed Hammer now works correctly. It previously worked at 50% effectiveness, it now is 100%. The damage per level is also increased from 5 to 6. Lightning Resist auras now has the same values as the other two elements. Holy Fire, Holy Freeze and Holy Lightning are now connected properly. Anyone with a bugged paladin will have to spec into the auras below the one you wish to use. Fire and Lightning Mastery skills now provide pierce damage like Cold Mastery. Blizzard, Thunderbolt, Hydra, Frozen Orb and Meteor have had their mana costs significantly reduced. Armageddon no longer incorrectly displays having Hurricane as a prerequisite. Thunderbolt no longer incorrectly displays having Chain Lightning as a prerequisite. Fixed a bug with Poison Mages having exceptionally high damage. High runes now correctly drop in a linear fashion instead of exponentially. Enigma's recipe has changed to Sur + Ohm + Gul. Enigma's +1 Teleport mod has been changed to +18 Convocation. Ice Arrow's description has been changed to correctly respresent the skill's damage. Raise Skeletons now gain 6 Life per Level. Conviction nerf has been reverted. Fixed base mana regeneration bug. All characters now correctly have 1.66% base mana regeneration (up from 0.83%). Fixed a bug preventing Druids from having both Spirit & Dire wolves at the same time. Base mana regeneration of all classes increased from 0.83% to 1.66%. The stash size has been increased from 6x8 to 10x10. Spawning Ubers by selling Stone of Jordans in Hell, has been replaced by the "Um" Rune. Ubers currently disabled. Drop rate of Runes is more linear and less exponential. This means higher runes are still increasingly rare but less rare than they were. Jewels can now spawn a new prefix: "Melee attacks deal splash damage"
Fire Arrow physical damage to fire damage conversion increased from 3% to 50% at Level 1. Base fire damage increased at all levels. Multiple Shot 3/4 weapon damage penalty removed. Strafe 3/4 weapon damage penalty removed. Immolation Arrow fire duration increased from 3 to 4 seconds. Average fire famage per second increased. Removed skill cooldown. Fire explosion damage increased. Synergies are more effective. Freezing Arrow synergy from Cold Arrow is more effective. Penetrate attack rating increased from +35% to +75% at Level 1. Avoid chance to dodge decreased from 24% to 22% at Level 1. Slow Missiles slow increased from 33% to 35% at Level 1. Valkyrie life reduced from (480-576) to 440 at Level 1. Attack halved. Jab now deals 100% of base damage and starts with +30% damage bonus up from -15%. Fend is now a level 18 skill. It now deals 125% of base damage. Druid's can now have both Spirit Wolves and Dire Wolves at the same time. Curses no longer have paths connecting themselves. You may put a point into any curse of your choice as long as you meet the level requirement. Decrepify's radius has been reduced and duration increased. Amplify Damage's radius has been increased and duration decreased. Most other curses have had various different buffs. Corpse Explosion's damage is reduced from (60-100)% to (40-60)% of corpse life. Every other damaging skill in this tab got some kind of damage increase. Skeleton Mastery has been removed. Tree pathing is completely redesigned. Duration of Revives increased from 180 to 600 at Level 1. Fist of Heavens cooldown has been removed. Holy Shock synergy is slightly more effective. Holy Bolt damage has been reduced. Heal has been significantly increased. Prayer synergy significantly increased. Blessed Hammer's synergies are less effective. Most other combat skills (excluding Charge) have received a damage buff. Most skills from Offensive Auras have received some kind of buff. Aura changes also affect mercenaries. Meditation has been nerfed slightly due to an increase in character's base mana regeneration per second. Most other Defensive Auras have been buffed. Blizzard's synergies are less effective. Most other cold skills got buffed. Static Field has been reduced from 25% to 20%. Most other lightning skills have had damage buffs. Warmth has been nerfed slightly due to an increase in character's base mana regeneration per second. Most other fire skills have had a damage buff. This page was last modified on 12 February 2019, at 15:38.